Since its launch in 2016, Genesis has continuously worked on strengthening its foundation for the brand’s future. To set itself apart from the competition in the automotive market, it strives for an understated, elegant brand experience. The Genesis Gangnam showroom aims at visualising a shift in perspective and focus from sales to experience. 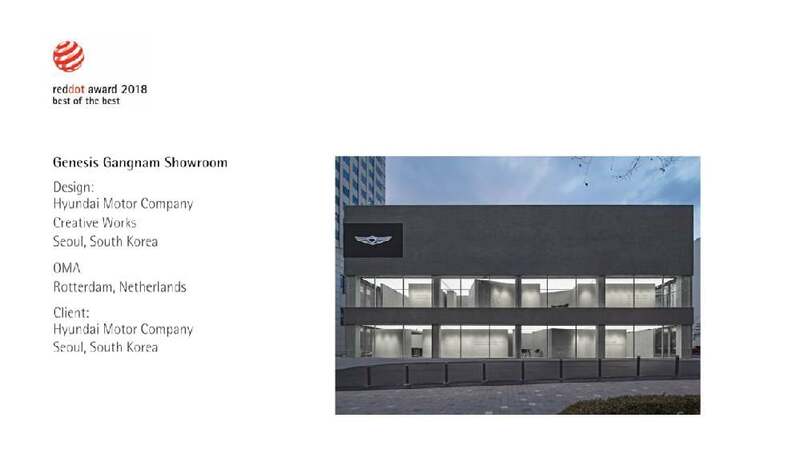 Whereas automotive showrooms are usually cluttered with distracting sales tactics, Genesis challenges those norms with a strategy of decluttering to create an area of gradual discovery where customers can experience the cars. The minimalist design of the concrete and glass facade allows only a small portion of the cars to be seen from the outside, creating a mysterious sense of purity that piques curiosity. Inside the space, distracting sales activities are replaced by distinctive, self-sufficient cubes to convey different sales functions. Furniture is blended into each cube by using the same colour and material, making the interior appear as if made from a single mould. Designed to create an authentic and personal experience, Genesis Gangnam thus represents a new kind of luxury. The new Genesis Gangnam showroom impresses with an outstanding elegant architecture featuring concrete and glass – an architecture that continues in the interior to equally purist effect. Based on the key idea that nothing should distract from the pure experience with the automobile, the brand clearly stands out in the market. Using high-quality materials and selected furniture, a showroom has been realised that conveys a truly holistic impression of these premium luxury goods.